Lay the leg onto a roasting tray and sprinkle over some sea salt and smoked pepper. 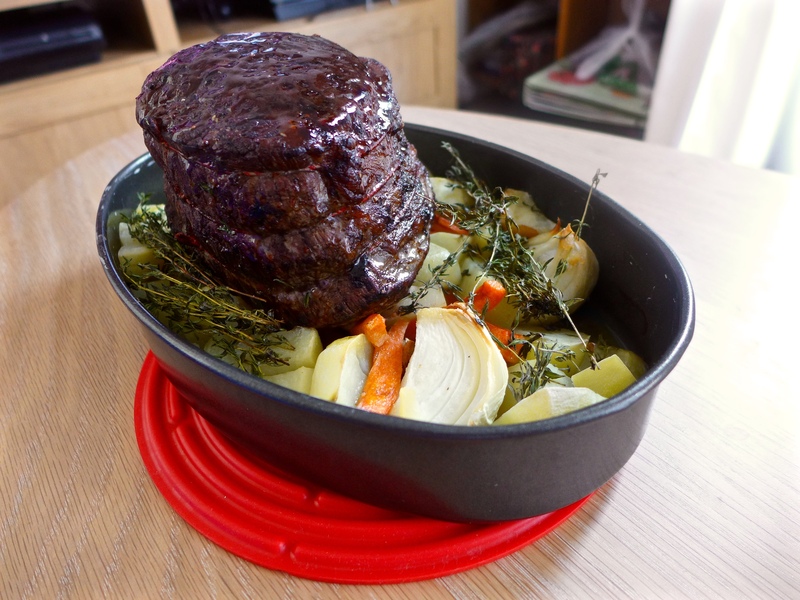 Roast for 60 minutes, or until the lamb reaches a core temperature of 58°C. To make the tomato sauce, heat the oil in a large frying pan, then add the onion and garlic and fry over a gentle heat for 5-6 minutes, stirring often, until softened but not coloured. Add the chopped tomatoes with the sugar, season well and turn the heat up so the sauce is bubbling gently. Cook for 40 minutes, stirring often. Meanwhile, make the meatballs. Put all the ingredients apart from the oil and cheese in a bowl. Season. Mix with your hands, then roll into 20-24 balls the size of walnuts. Heat the oven to 220°C/200°C fan/ gas 7. Heat the oil in a frying pan over a high heat. When hot, add the meatballs, frying on all sides for 5-6 minutes until golden. Drop them into the sauce for the last 5 minutes of cooking. Transfer to an ovenproof dish and top with the cheese. Season, then bake for 8-10 minutes until the cheese has melted. Mix the butter with the garlic and parsley. Slice the baguettes at an angle into thirds, split them open and pull out most of the insides (see tips). Spread the baguette shells with the garlic butter and set aside. Let the meatballs stand for 2-3 minutes, then serve with the garlicky baguettes. Use the baguettes to scoop up the meatballs and sauce, which will melt the butter. Wrap the crackers in a tea towel and smash up until fine, breaking up any big bits with your hands, then tip into a large bowl. 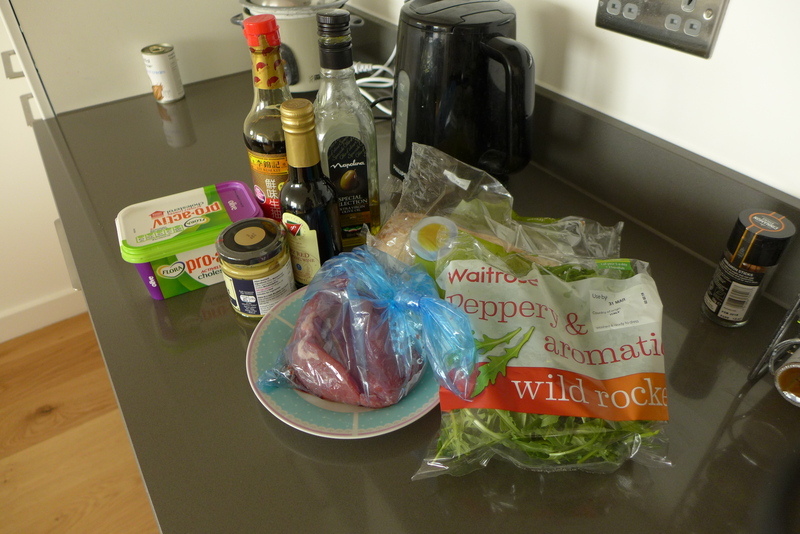 Finely chop the parsley (stalks and all), then add to the bowl with the mustard (if using), and the minced beef. Crack the egg into the bowl, then add a good pinch of sea salt and black pepper. With clean hands, scrunch and mix everything up well. Divide into 6 and pat and mould each piece into a roundish shape, roughly 2cm thick. Place the burgers onto a plate, drizzle with oil, then cover and place in the fridge until needed – this will help to firm them up. To cook the burgers, preheat a large griddle or frying pan for 4 minutes on a high heat, then turn the heat down to medium. Place the burgers on the griddle or into the pan, then use a spatula to lightly press them down, making sure the burger is in full contact with the pan. Cook the burgers for 3 or 4 minutes on each side, depending on how you like them – you may need to work in batches. Meanwhile, wash and dry a few small lettuce leaves, tearing up the larger ones. Slice the tomatoes, peel and finely slice the red onion, then slice the gherkins lengthways as finely as you can. Place all the veg toppings, and the cheese (if using) on a platter and put in the middle of the table with plates, cutlery, ketchup and drinks. Once cooked, remove the burgers to a plate and carefully wipe the pan clean with a ball of kitchen paper. Halve the burger buns and lightly toast them in the pan, then serve up. 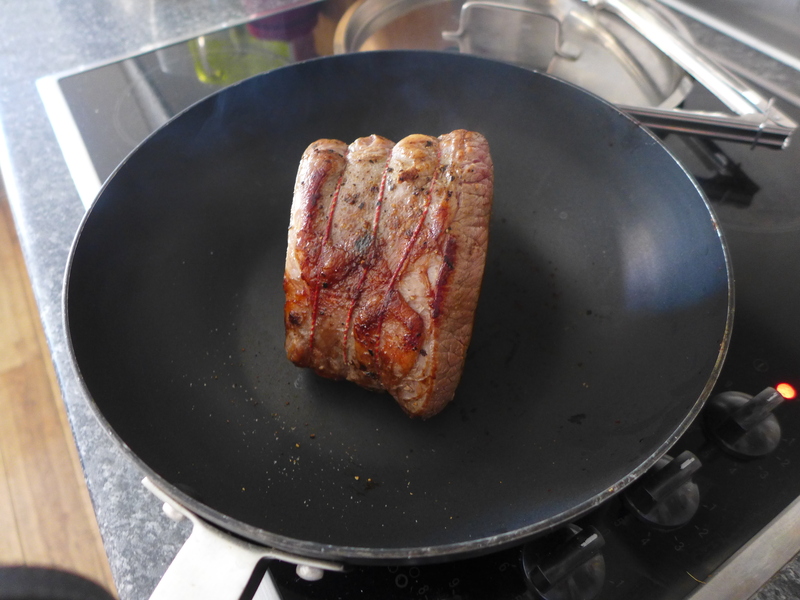 Heat the butter in a large frying pan and fry the beef fillet for 5 mins, turning it to seal and brown it all over. Remove from the pan and leave to cool. Add the shallots to the buttery meat juices and cook, stirring, until softened and golden. Turn off the heat and tip out two-thirds of the shallots into a bowl. 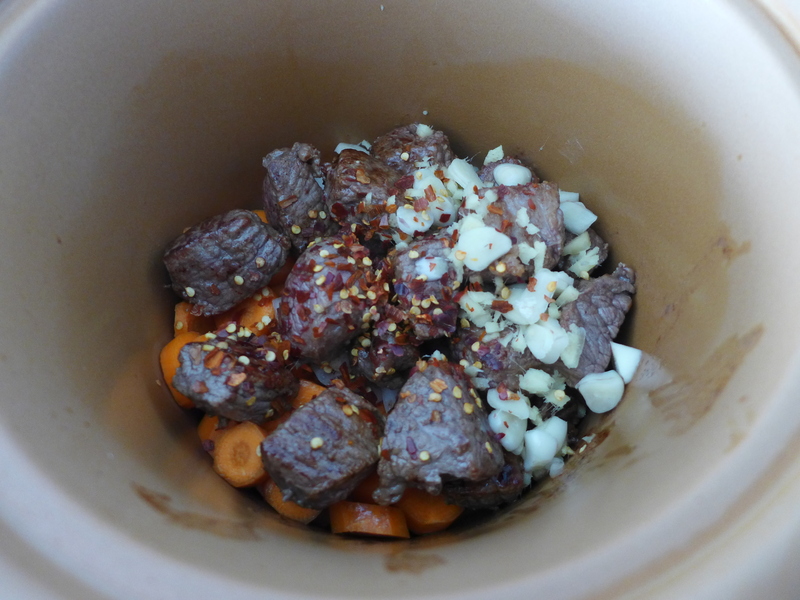 Add the horseradish and some black pepper to the bowl, then blitz with a hand blender to make a coarse purée. Meanwhile, pour the red wine and stock into the pan with the remaining shallots. Blend the cornflour with 3 tbsp water, add to the pan with the redcurrant jelly, and stir until thickened. Season to taste and allow to bubble for at least 5 mins until it has become a sauce. Cool and chill until ready to serve. Lay 8 slices of prosciutto in 2 overlapping rows. Spread the horseradish mixture on top and scatter evenly with the herbs. Place the fillet on top, cover the ends with the last 2 slices, and tightly wrap the prosciutto around the beef. 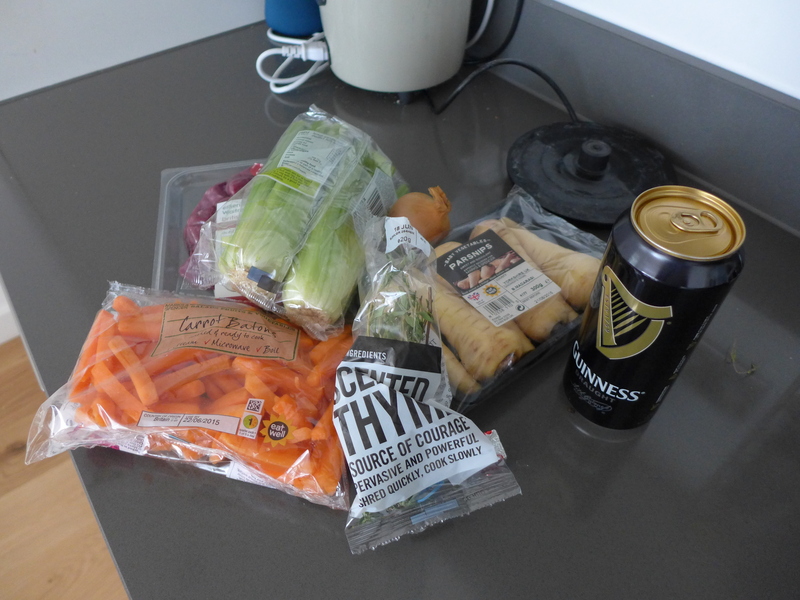 Chill until ready to cook. Leave to rest for 10-15 mins, then carefully slice with a very sharp knife and serve with the wine sauce. Scatter with extra thyme, if you like. 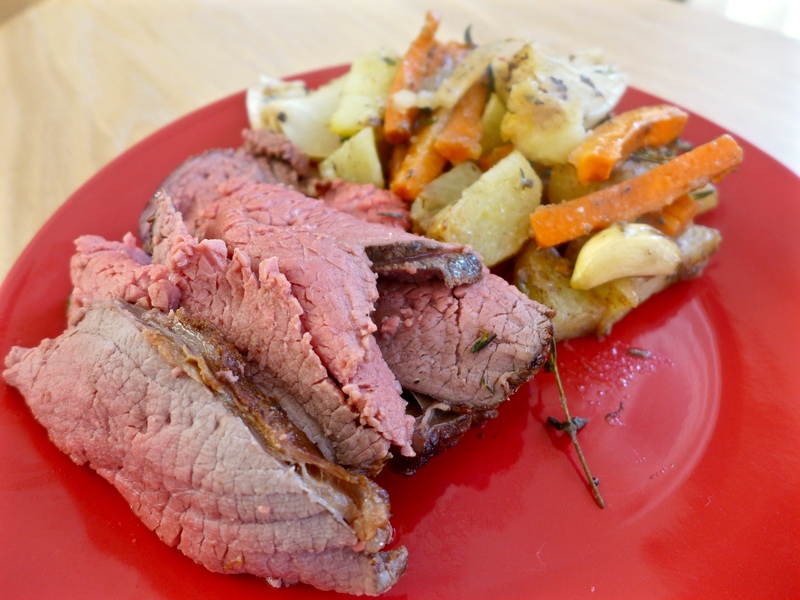 Take your beef out of the fridge 30 minutes before it goes into the oven. Preheat your oven to 240°C/475°F/ gas 9. There’s no need to peel the vegetables – just give them a wash and roughly chop them. Break the garlic bulb into cloves, leaving them unpeeled. Place the roasting tray in the preheated oven. 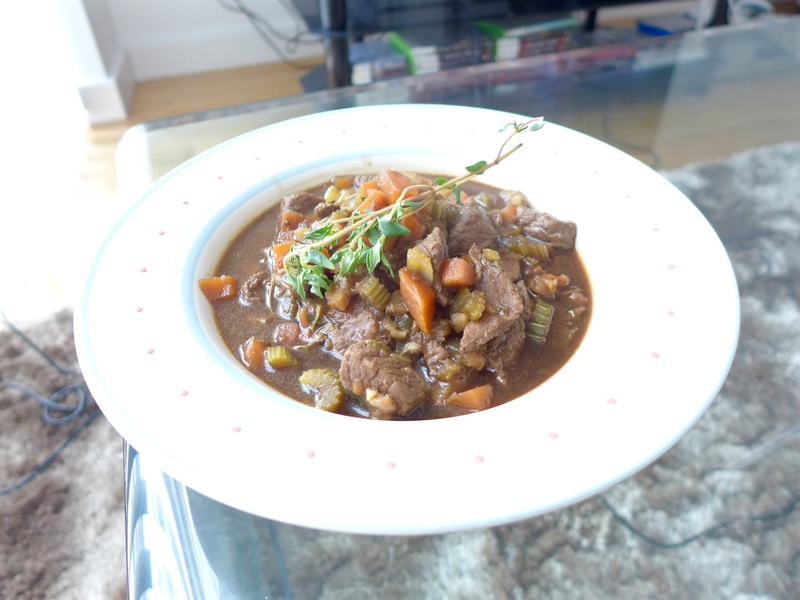 Turn the heat down immediately to 200°C/400°F/gas 6 and cook for 1 hour for medium beef. If you prefer it medium-rare, take it out 5 to 10 minutes earlier. For well done, leave it in for another 10 to 15 minutes. If you’re doing roast potatoes and veggies, this is the time to crack on with them – get them into the oven for the last 45 minutes of cooking. 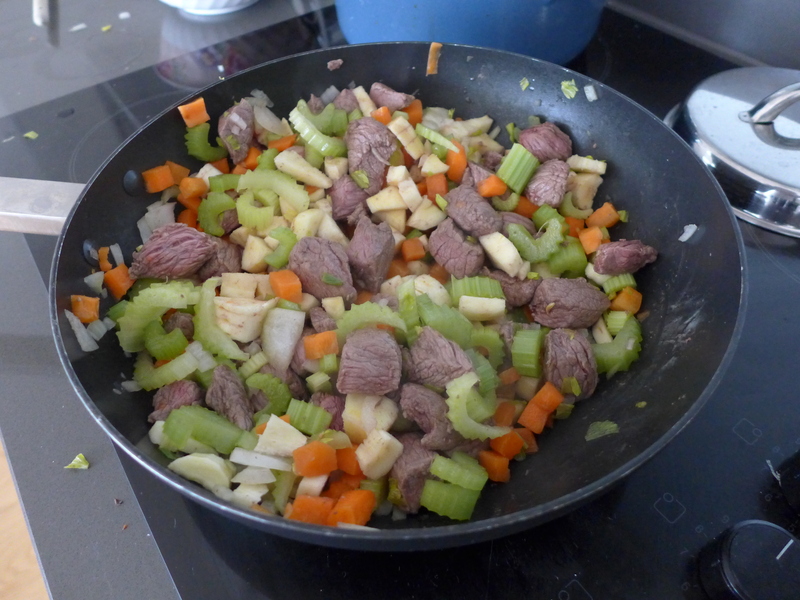 Baste the beef halfway through cooking and if the veg look dry, add a splash of water to the tray to stop them burning. When the beef is cooked to your liking, take the tray out of the oven and transfer the beef to a board to rest for 15 minutes or so. Cover it with a layer of tinfoil and a tea towel and put aside while you make your gravy, horseradish sauce and Yorkshire puddings. Bring a large pot of water to a boil over high heat. Meanwhile, cut top off peppers and remove seeds. 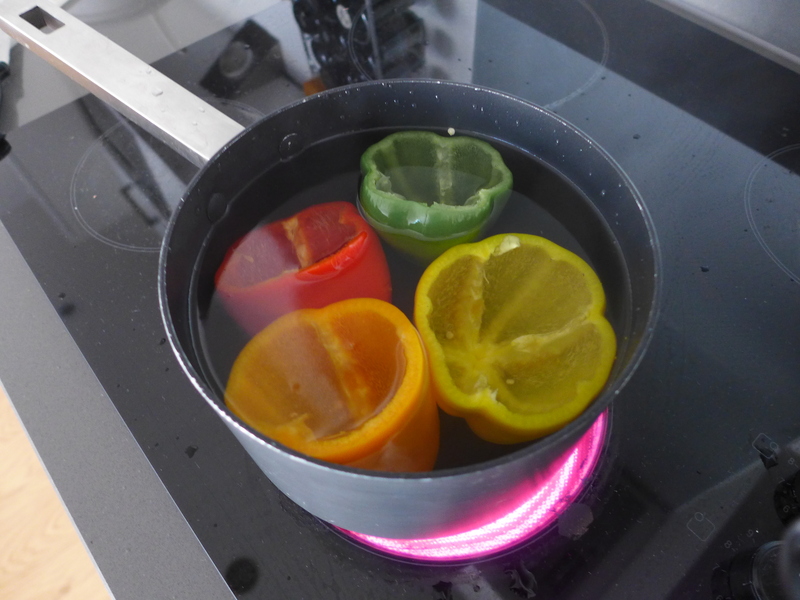 Add salt to boiling water, then add peppers and boil, until brilliant in colour and their flesh slightly softened, about 3 minutes. Drain, set aside to cool. Preheat oven to 180 degrees. Heat 4 tbsp of the oil in a large pan over medium heat. Add onions and cook, stirring often, until soft, about 5 minutes. Add the garlic and cook a minute more. 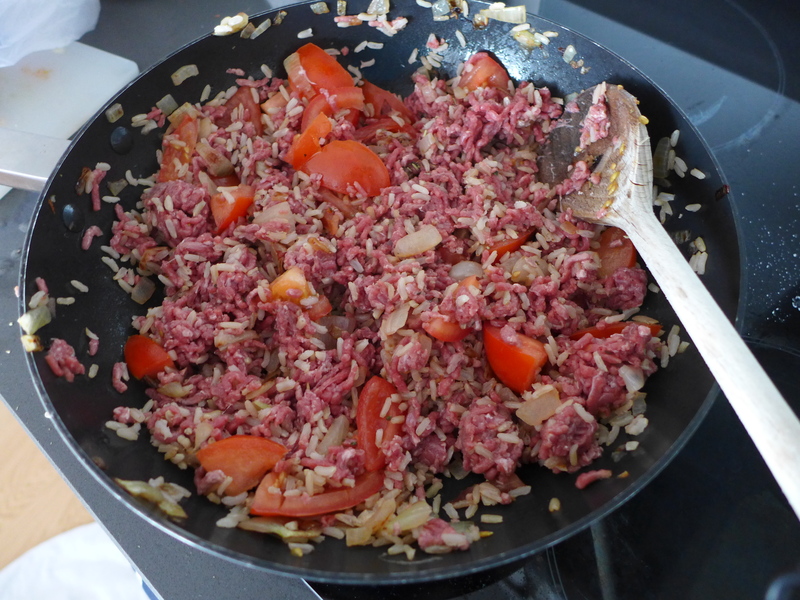 Remove pan from heat, add the beef, rice, tomatoes, and dried herbs, and season generously with salt and pepper. Mix well. 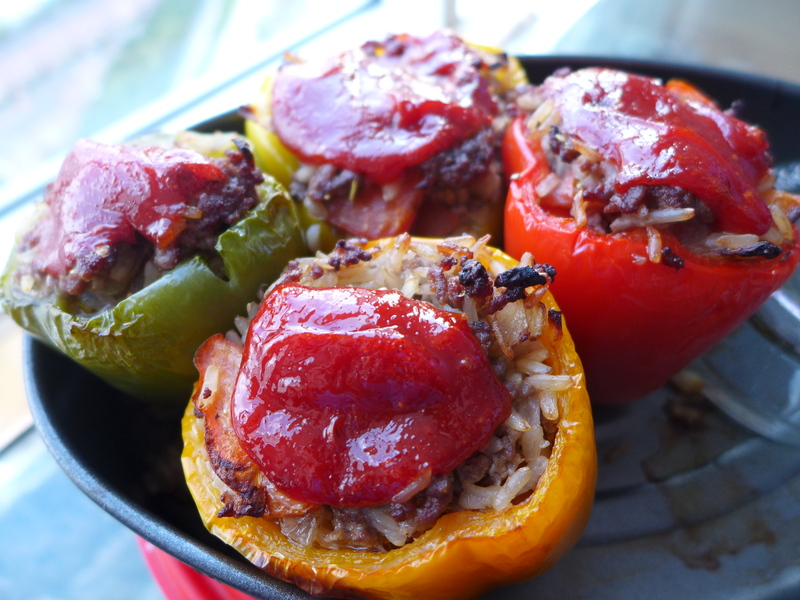 Drizzle remaining 1 tablespoon of olive oil inside the peppers. 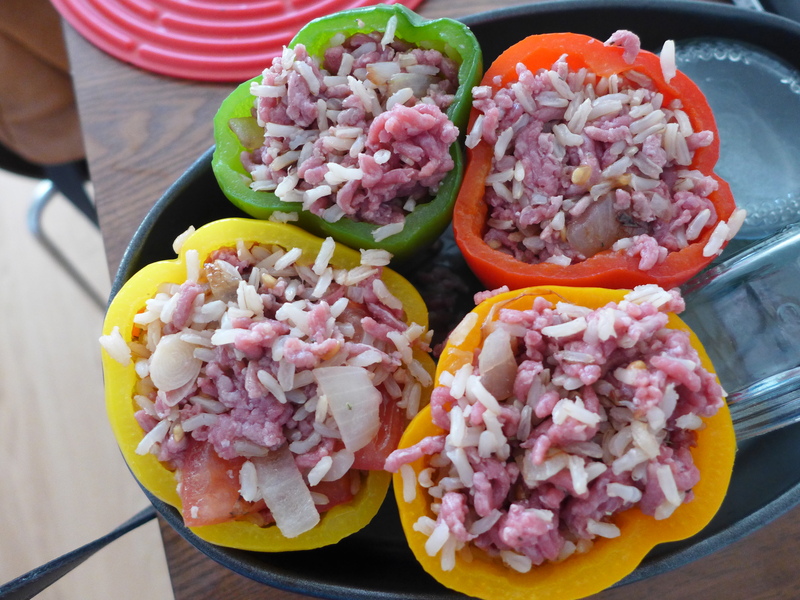 Arrange the cut side of the peppers up in a baking dish, then stuff peppers with filling. 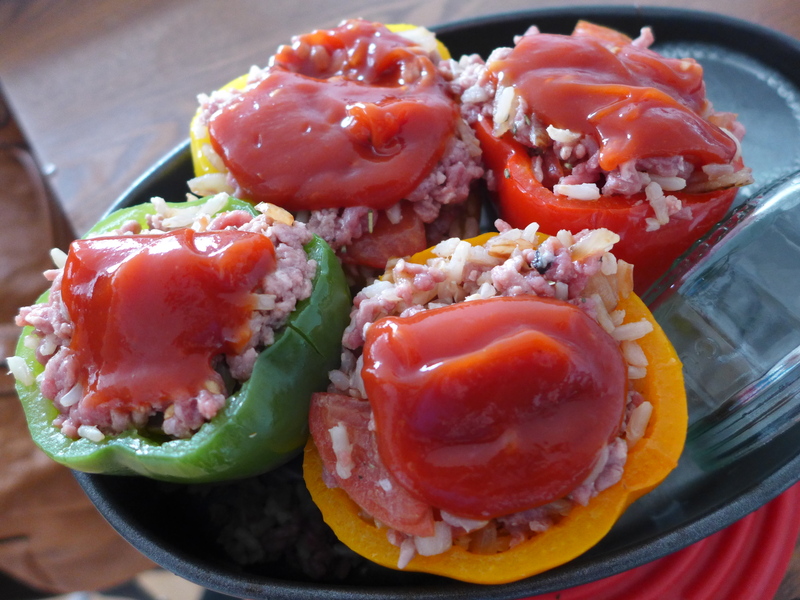 Combine ketchup, Worcestershire sauce, Tabasco sauce, and 1/4 cup of water in a small bowl, then spoon over filling. Add 1/4 cup of water to the baking dish. Place in oven and bake for 40-50 minutes. Needs a bit more salt the next time I cook this. Consider adding whole black peppercorns to get it more of a kick. All in all, it was a good meal. Very homey and wholesome. 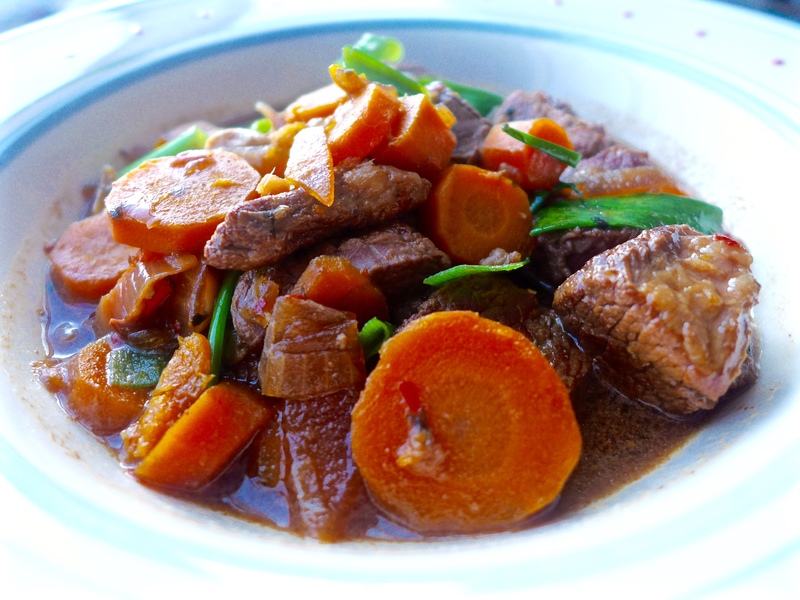 Place the onion and carrots into a slow cooker. Heat the oil in a large non-stick frying pan, then fry the beef in two batches until golden-brown, transferring to the slow cooker when ready. Scatter with the garlic, ginger and chilli. Stir the sugar, miso, soy, stock and sesame oil into the juices in the frying pan then bring to a simmer, stirring to dissolve the miso and sugar. 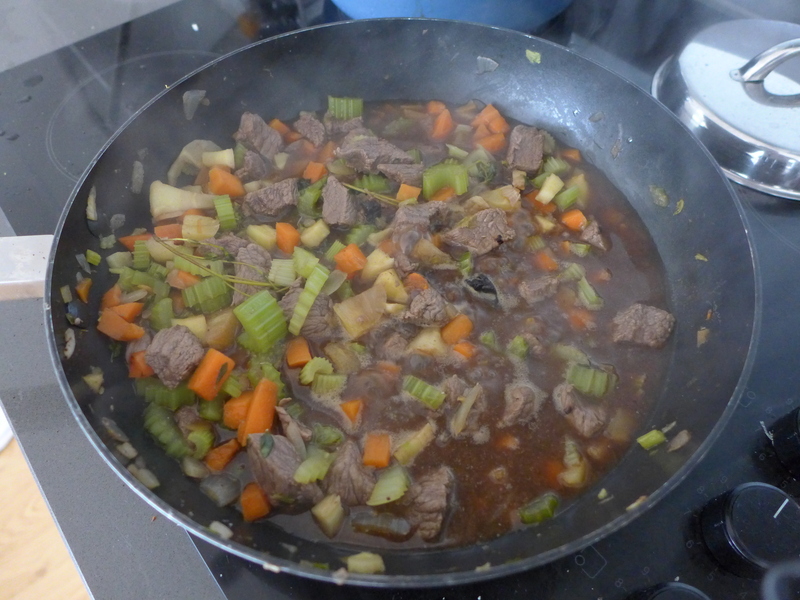 Pour the hot liquid over the beef and vegetables, cover with the lid and cook on Low for 7½ hours. 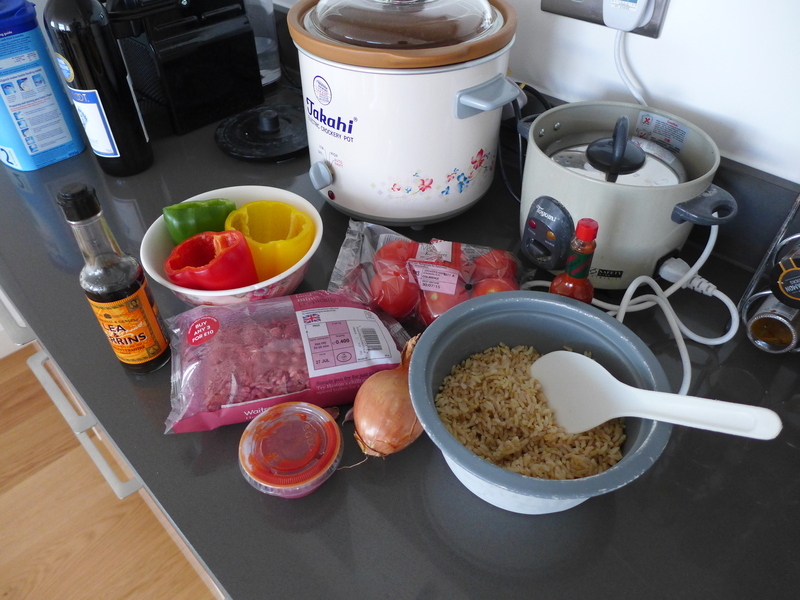 Scatter with the spring onions, re-cover the slow cooker then cook for another 30 minutes until the onions are tender. Stir in the beansprouts, then drizzle with a little more sesame oil. and reduce by half. 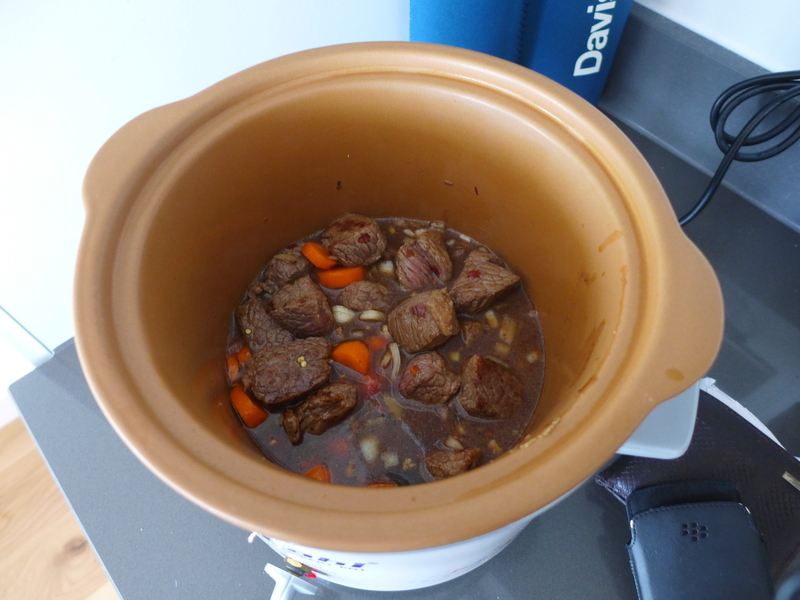 Add the beef stock and herbs and simmer very slowly for between an hour and an hour and a half. 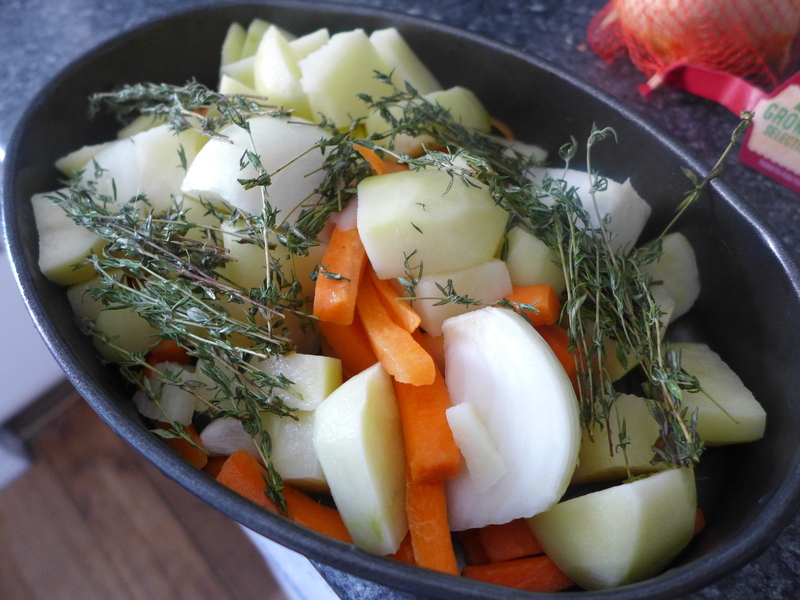 Serve with the champ potato and honey roast carrot and parsnip. 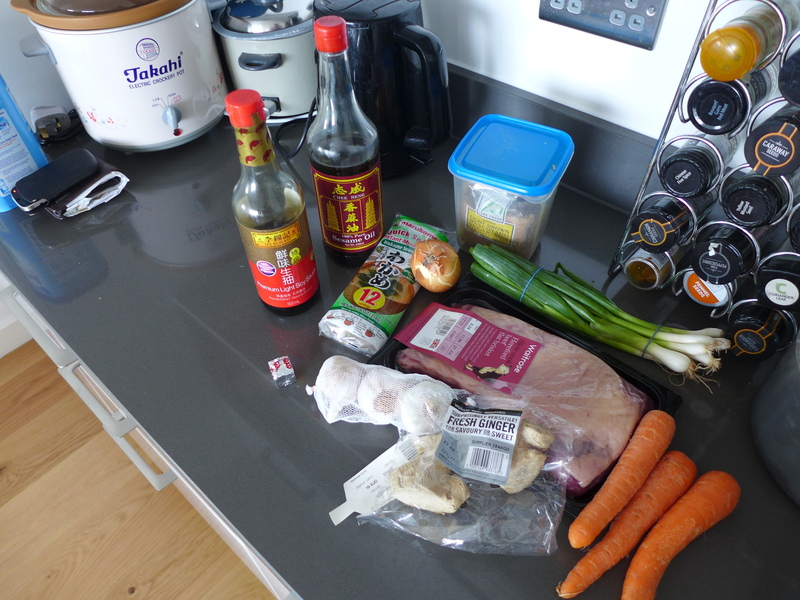 Mix the wine, soy sauce, mustard and sugar in a big bowl. 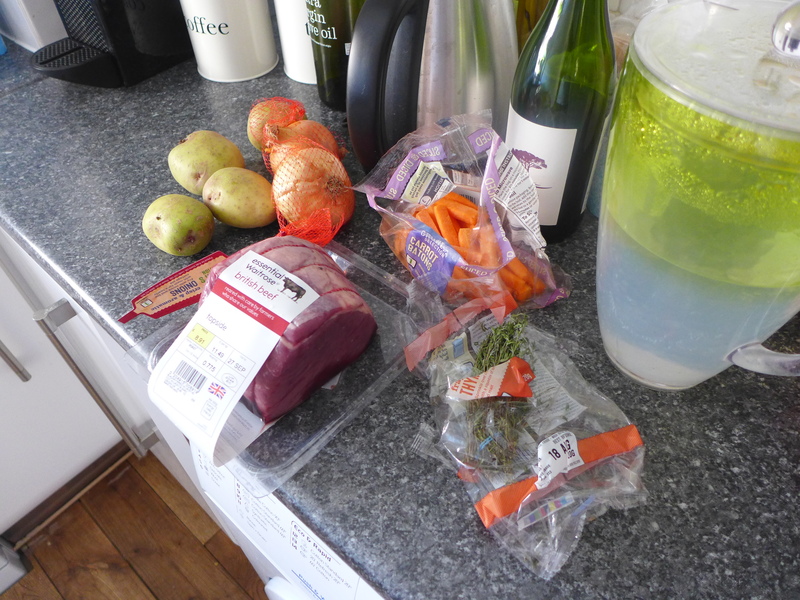 Toss in the steak strips, season well with pepper and leave to sit and soak while you get everything else ready. Pour the oil into a large frying pan and heat it up over a medium heat for a minute or so. Tip in the onion slices, turn the heat up to very high and cook for 3-4 minutes, stirring often to get the onions really golden brown. Take the onions out and keep them warm. Lift the steak strips out of the marinade with a slotted spoon and stir fry them in the onion pan over a very high heat for 30 seconds (do it in two batches if it’s easier). 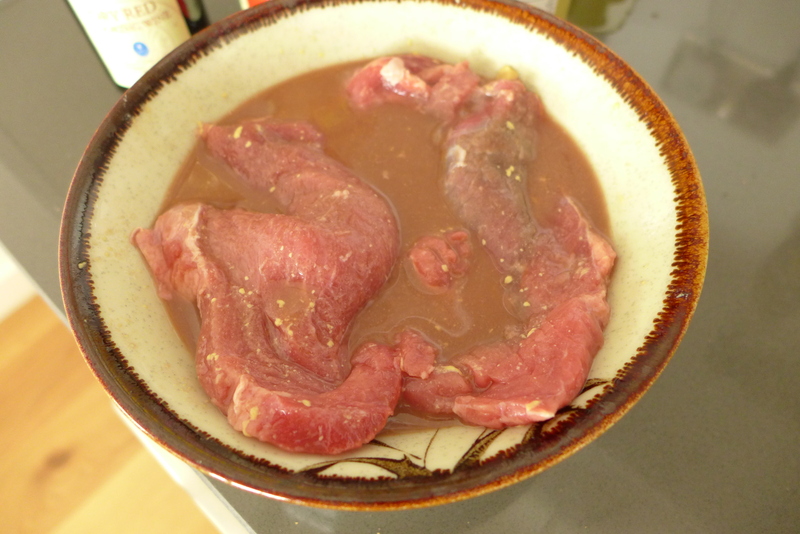 Pour in the marinade from the bowl and boil for a few seconds until it sticks to the meat but is still juicy. Season with salt and pepper and keep warm. 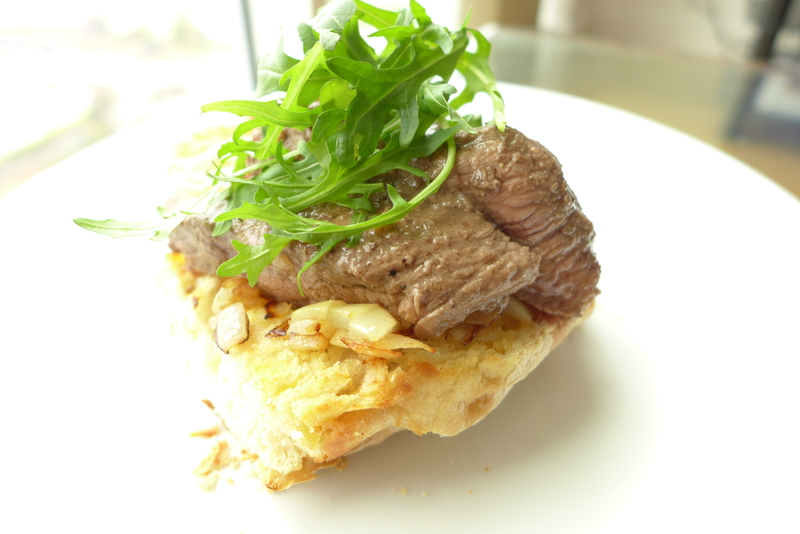 Toast the bread and then spread with the garlic butter and cut each slice in half. Overlap two pieces of toast on each plate, top with a spoonful of onions, then the steak and more onions. Put a little pile of watercress on each plate and serve straightaway. Preheat the oven to 200ºC/gas mark 6/400ºF. Put the eggs into a pan of water, bring to the boil and let it boil for 7 minutes, then pour off the water and sit the pan under an abundantly flowing cold tap; turn it off and leave the pan filled with cold water in the sink until the eggs are cool enough to peel. Warm the oil in a large, heavy-based pan (that comes with a lid), then add the onion, sprinkle with salt, and let it cook for a few minutes until it begins to soften. 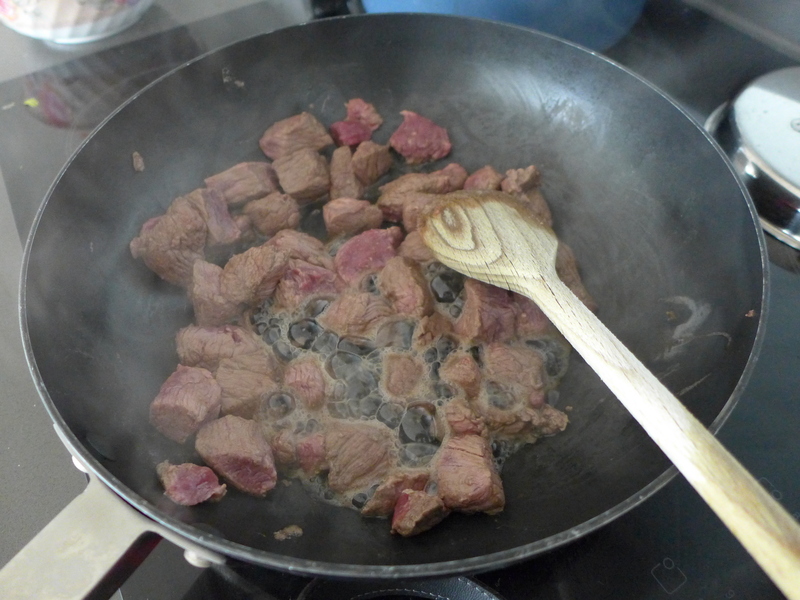 Add the meat and turn it in the pan just long enough for the raw red colour to turn brown. Add the wine or vermouth, then the passata, pouring the water into the empty passata bottle or carton and swilling it out into the pan. Bring to a bubble, then put the lid on the pan and cook at a robust simmer for 5 minutes. Peel and finely slice the eggs (which will crumble into a mess), and finely slice the mozzarella; then put a deep, greased lasagne dish, measuring approx 34 x 23 x 6cm / 9 x 13 x 2 inches, onto a baking sheet and get ready for the grand assembly. 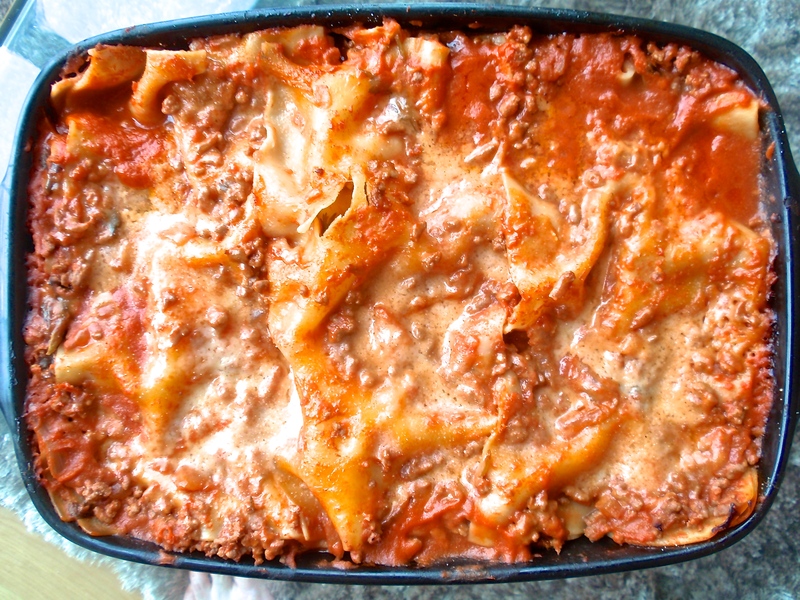 First, put a ladleful or so of very runny meat sauce into the bottom of the lasagne dish, to line the base, then arrange a layer of lasagne sheets – using about a quarter of them – on top, to cover the sauce – don’t worry about a bit of overlapping. Add another ladleful of sauce, just to wet the sheets, then add a layer of ham slices, using up a third of them, before dotting with a third of the egg and of the mozzarella slices. 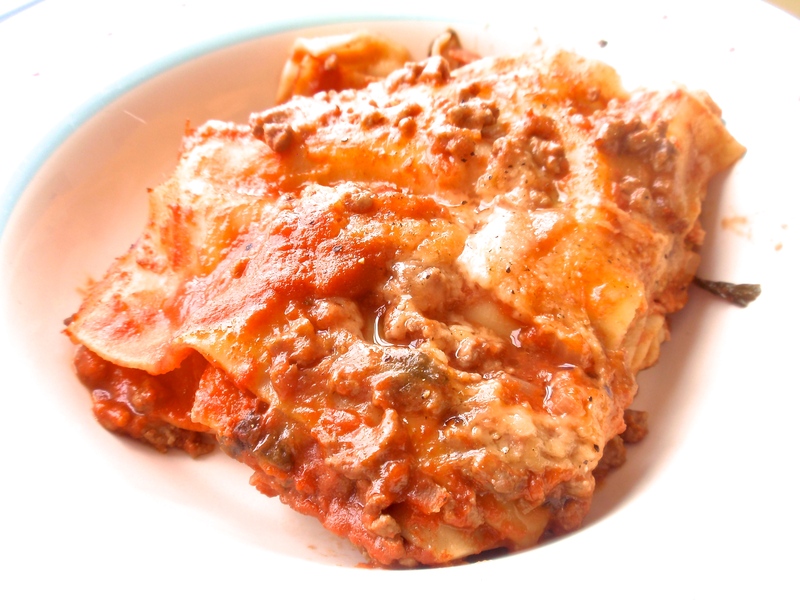 Now add a second layer of lasagne sheets, then a couple of ladlefuls of sauce, followed again by a third of the ham, then egg, then mozzarella slices. Repeat with a further layer of lasagne sheets, another 2 ladlefuls of meat sauce, then the remaining ham, egg and mozzarella slices, before topping with a final layer of lasagne sheets. Pour the remaining sauce over the top, sprinkle with the Parmesan and cover with foil – making sure the edges are sealed – and put in the oven still on the baking sheet, for 1 hour.